An administrative error by the Irish FA has ended Motherwell defender Brian McLean's international career with Northern Ireland. The 21-year-old played for the Scotland U17 side in a competitive game before switching his allegiance to N Ireland. McLean is ineligible under Uefa rules because he needed to play a competitive match for NI before he was 21 after his earlier appearance for the Scots. The centre-half has featured in senior and U21 friendly fixtures only. 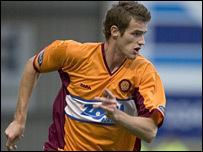 The IFA say they were not aware that McLean had played for Scotland at U17 level in a Uefa competition in 2002. Fifa have confirmed McLean's ineligibility to effectively end his international career. "This is an administrative error by the Irish Football Association and there is no getting away from that," IFA president Jim Boyce told the News Letter. "We feel desperately sorry for Brian as he is a young lad looking to progress his career." McLean had been brought into the U21 squad for Wednesday night's European Under-21 Championship qualifier first leg against Liechtenstein in Vaduz, which N Ireland won 4-1. But the central defender was withdrawn when it was confirmed he could not represent the country. Boyce added: "We sent papers to Uefa last week, but they replied a few days later to tell us Brian McLean was inegible to play. "If we had taken a risk and played him against Liechenstein, we would have forfeited the game and they would have been given a 3-0 win. The news comes just a week after McLean was named the Bank of Scotland Young Player of the Month for March.